Here are some of the children from the May Procession standing outside the chapel in around 1938. They are (from left to right): Ann Kiernan, Margaret McAuley, James Murray (? ), Helen Connor (May Queen), Rena Harvey, Joseph Fanning, Arthur O'Hagan and Tom Kelly. This page was added by Geraldine Sharkey on 20/09/2013. 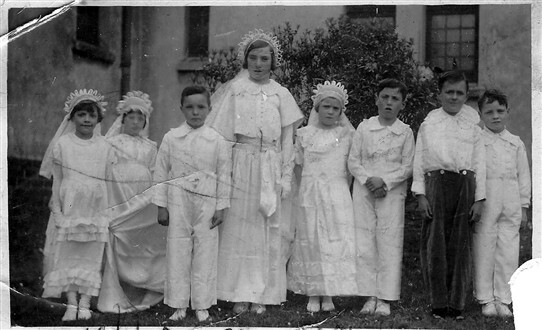 My father (Dennis Kiernan) said the first girl in the picture is his aunt Ann Kiernan.